This programme moves up school with the children so from September 2019 we will be using Maths Mastery from YR-Y2. As a trust we have decided to follow White Rose Maths for children from Y2-Y6. The White Rose schemes of learning which are also designed to support a mastery approach to teaching and learning, as well as to support the aims and objectives of the National Curriculum. White Rose believes that all children, who are introduced to a concept, should have the opportunity to build on their abilities by following a concrete-pictorial-abstract approach. 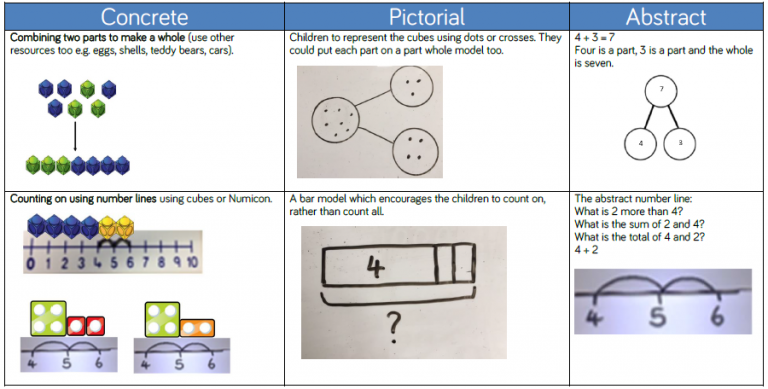 Below is an example of this approach in relation to teaching addition. Here at Croxteth Community Primary School, we are introducing a fantastic online way to develop knowledge of times tables and division facts for all pupils from Y1-Y6. Times tables are recognised as essential to access many mathematical concepts and knowledge will be assessed at the end of Y4, from September 2019, by a National test. When it comes to times tables, speed AND accuracy are important – the more facts your child remembers, the easier it is for them to do harder calculations. Times Table Rock Stars is a fun and challenging programme designed to help pupils master the times tables! Your child’s teacher has introduced them to how Times Tables Rock Stars works and the appropriate times tables to practice on a weekly basis will be allocated. This programme can be accessed online via the web address on the attached letter – your child has their own login and password. You may also download an App for the Iphone/Ipad or Android App through which your child may practice. Apple App Android App When they first login, your child will choose their own rock star name and design their own avatar before starting to practise. There are two single player modes to play: Garage – This is the main mode the children should play. The questions will only come from the times tables the teacher has set for the week. As pupils start to answer questions, TT Rock Stars works out which facts they take longer on and will give them more of these questions to answer. Studio – the questions in the Studio can be anything from 2×2 up to 12×12. TT Rock Stars calculates each the mean speed from their last 10 games in the Studio and translates into a Rock Status. There are also multi-player modes: Rock Arena – The Arena allows players to compete against all other members of their Band/Class (their Band mates would need to join the same game in order to compete together). Rock Festival – The Rock Festival games are open to players from around the world. The questions are selected at random from 2×2 to 12×12. It is recommended that that your child does a little bit of times table practice every night. Short bursts of practise on a daily basis are more effective than spending hours once a week. To make a success of this programme and ensure that your child follows the programme of practising and remains motivated we need your help. Without your praise and your reminders, without you sitting down next to them or checking their work, practising times tables will not feel important to your child. Thank you for your support and I am sure your hard work and theirs will have a direct impact and make them a Times Table Rock Star!